"Cache Status" is an easy cache status and management tool located right in your address-bar. It displays the amount of memory and disk space that is allocated to the browser cache. Beside the live updates of cache status, you can clear browser cache through the right click context menu. This extension can help monitoring Firefox's cache usage in a distraction free way and get alert when clean up is necessary based on the amount of memory and hard disk available on your operation system. What is Cache Status and how does it work? This add-on adds a customizable presence to your browser window's statusbar that gives you up-to-date information on your browser's cache usage, both RAM and the hard drive. The presence also has a right-click context menu, where you can easily clear your browser's cache. It can also automatically clean your cache when it reaches a specified level, through its Options. What does cache mean in regards to the computer? In computing, a cache is a component that transparently stores data so that future requests for that data can be served faster. The data that is stored within a cache might be values that have been computed earlier or duplicates of original values that are stored elsewhere. If requested data is contained in the cache (cache hit), this request can be served by simply reading the cache, which is comparatively faster. Otherwise (cache miss), the data has to be recomputed or fetched from its original storage location, which is comparatively slower. Hence, the greater the number of requests that can be served from the cache, the faster the overall system performance becomes. Is it possible to move the UI to statusbar of Firefox (like older versions)? Yes, if you don't like the new addressbar look in version 0.8.1, install version >= 0.8.3 from https://addons.mozilla.org/en-us/firefox/addon/cache-status/versions/. The icon will appear in the statusbar if it is available (restart required). 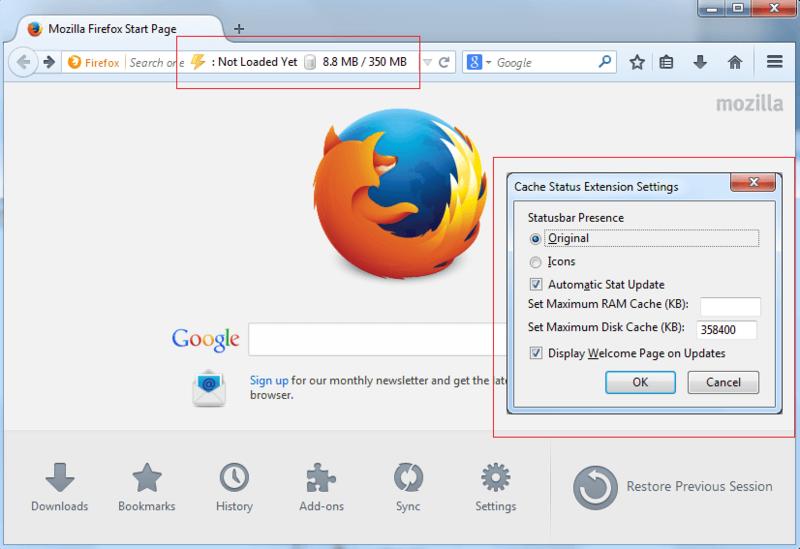 How can I uninstall Cache Status extension from my Firefox? To uninstall the extension go to Firefox -> Add-ons -> Cache Status, then press Uninstall button. How can I access the Addon's settings? Go to Firefox -> Add-ons -> Cache Status, then press Options. Firefox's default disk Cache is set to 358400. Can this be changed? Yes, head to about:preferences#advanced -> Network tab and check "Override automatic cache management". Now you can define the amount of disk Cache to be used by Firefox.